Dozens dead in Tunisia gun attack Jump to media player Dozens of people are killed in an attack on a beach near two tourist hotels in the Tunisian resort town of Sousse, the interior ministry says. Tunisia survivor: 'Bullet hit my arm' Jump to media player A man who survived a gun attack on a popular tourist beach in Tunisia speaks of the moment two gunmen struck. 'There's gunfire on the beach' Jump to media player The father of a holidaymaker in the Tunisian resort town of Sousse tells BBC News what his daughter witnessed of the attack on a beach near two tourist hotels. Witness 'fled whizz of ammunition' Jump to media player Witness Gary Pine was sitting on the beach near his hotel when he thought he heard firecrackers going off; tourists raced inside when they heard the "whizz of ammunition and gunfire". 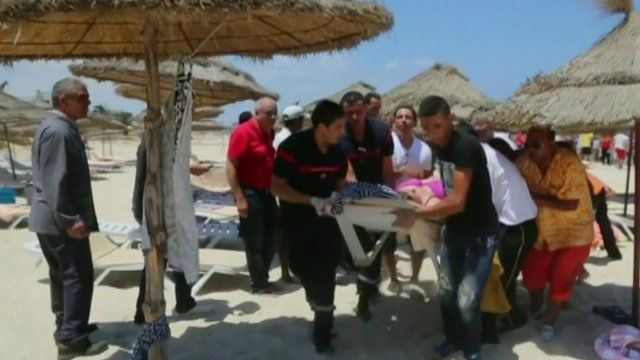 Dozens of people have been killed, mostly foreigners, in an attack on a beach near two tourist hotels in the Tunisian resort town of Sousse, according to the health ministry. Officials say one gunman has been shot dead. Another suspect has been detained. In March, militants killed 22 people, mainly foreign tourists, in an attack on a museum in the capital Tunis.